My fave tunes are "Bo-Bo," "Lady Godiva," "and "Miss Frenchy Brown." But the standout track to me is "Treasure of San Miguel." The sweeping majesty of this tune makes it the soundtrack to any adventure film I can imagine. (Okay, the Indiana Jones theme beats it by a little bit). Just turn the sound down during scenes from National Treasure or the Michael Douglas Romancing The Stone films and play "Treasue" behind it and you'll see how well it works! 01/30/67 - Gold Star Recording Studio - Lady Godiva, Wade In The Water - Herb Alpert - trumpet, Nick Ceroli - drums, Bud Coleman - mandolin & guitar, Bob Edmondson - trombone, Tonni Kalash - trumpet, Sal Monte - ?, Lou Pagani - piano, John Pisano - guitar, Pat Senatore - bass, Julius Wechter - marimba. 02/22/67 - Colgems - Casino Royale - Herb Alpert - trumpet, Nick Ceroli - drums, Tonni Kalash - trumpet, Sal Monte - ?, Lou Pagani - piano, John Pisano - guitar, Pat Senatore - bass, Julius Wechter - marimba, Jules Chaiken - trumpet, Bill Pitman - guitar, Ernie Tack - trombone, Dave Wells - trombone. 03/06/67 - Gold Star Recording Studios - Gotta Lotta Living To Do - Herb Alpert - trumpet, Nick Ceroli - drums, Bud Coleman - mandolin & guitar, Lou Pagani - piano, John Pisano - guitar, Pat Senatore - bass, Julius Wechter - marimba, Lew McCreary - trombone, Pete Jolly - piano. 03/08/67 - Gold Star Recording Studios - Slick, Town Without Pity, In A Little Spanish Town - Herb Alpert - trumpet, Nick Ceroli - drums, Bud Coleman - mandolin & guitar, Tonni Kalash - trumpet, Sal Monte - ?, Lou Pagani - piano, John Pisano - guitar, Pat Senatore - bass, Julius Wechter - marimba, Lew McCreary - trombone. What a great album this is! Not as good as SRO, but close. My chioice was Wade In The Water. In fact this tune, is so good, I would put it up there with Flamingo in a tie for the best TJB song ever. Casino Royale I catagorize as another top 5 best ever song, and its easily my second choice. Sounds Like has a great opening song, a great lp cover and there really isn't a bad song on the album. This album is a tremendous display of "in-house" talent. Over half of the playlist(if you count Burt Bacharach, and I am) comes from A&M affiliated artists, and it's some of the finest work of each. I can't think of any other TJB album where the locals outshine the standards like they do on this one. I picked John Pisano's THE CHARMER as my fave, because I think it's one of his best works. It just has a soft, cute vibe. I think SOUNDS HAPPY is a pretty good name for this album, because it's a very upbeat set coming after the rainy-day vibe of WNML and the driving but rather melancholy SRO. The rhythm section reached a climax with this album. This album is so cool! Excellent album for sure. This is the 'peak after the peak' for me...probably my third-favorite TJB album (after GOING PLACES/WARM (always tied for #1) and BEAT OF THE BRASS. I never saw that "Sounds Happy" cover before...that title doesn't really fit with that melancholy picture of Herb does it. I'm also surprised that the "little LP" doesn't include "Casino Royale," the big hit from the album. I notice "Slick" listed among the songs recorded during these sessions. Amazing -- I don't think it'd fit in here or on NINTH, yet it fits in perfectly with the musical environment of BEAT which came two albums later. Actually, I think it was common for jukebox "albums" to include mostly album tracks and not the singles, since the singles would already be there in the machine as 45's. 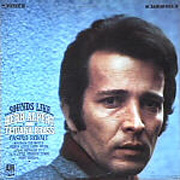 This is the only Herb Alpert "Little LP" I happen to own. As for the album, I've mentioned here before that when this title came out, I was unaware of a new album from the Tijuana Brass. My parents came home from a shopping trip at Sears one evening and brought this album home as a surprise. Both were afraid that might have bought a sonic "knock-off" of the Tijuana Brass, since the album was titled ...SOUNDS LIKE...Herb Alpert & The Tijuana Brass. This was during a period of heavy TJB sound-alike bands trying to capitalize on Herb's sound. Once I put it on the turntable though, everyone was relieved that it was a genuine new album, and I was happy to have all of these new songs to listen to. It's tough to pick a favorite here, as I really like "Casino Royale", "Treasure Of San Miguel" and "The Charmer." But I have to give it to "Wade In The Water", and might I add that the track never sounded better than it does on the Shout! Factory remaster. The "?" after Sal Monte's name got me curious. I did a web search and found several Sal Montes. One was a trumpeter who also served as Harry James's manager and continues to manage the James organization. He's also often listed as a "consultant" on numerous James bios, tributes and other media projects relative to Harry James. There's another Sal Monte who invented a means of bonding organic materials to inporganoic materials, specifically, organic oxide to inorganic polymers (i.e. : recording tape). I doubt that's who this is, unless Gold Star was testing new materials and machines and he was present (though that wouldn't get a musicain credit as far as I can tell). The Charmer sounds like a standard...woulda made a nice vehicle for Claudine L! In addition to Roger Nichols, Herb would soon enough have the fine songwriting talents of Boyce & Hart, and Emmitt Rhodes...It's a shame that henceforth, he didn't push forward with the inclusion of the "new" pop offerings from these cats. With this LP, one gets the feeling he's about to burst the ensemble though a ring of fire -- given the driving, tension-filled arrangements that characterize this LP. He certainly sounds poised to take on the likes of Booker T & The MGs -- not to mention the BMB. Exactly!! Note that there's a lot more piano on this LP, too. These arrangements are difficult to artistically capture. Town Without Pity, for instance, drives so hard and wild (and loud!!) that it seems like it's about to careen away at moment's notice! (the perfect side 2 folly after Wade In The Water's endless coda). Following this LP, the group's sound seem to stop its unique evolving process -- as the subsequent LPs do not produce as many "left turns" and musical surprises/oddities that had been a hallmark of Herb's arrangements since ! !Going Places!! ; Herb's playing also took a noticeable technical nosedive on Ninth. From an arranger's and player's point of view, the music and style from Ninth, Beat of the Brass and The Brass Are Comin' was easier to emulate than the ! !Going Paces!! - ...Sounds Like... period which was far more varied and innovative in overall approach. And that it came out before 1970. The "?" after Sal Monte's name got me curious. Anyone else have any ideas? Sal was Road Manager for The Brass and can be seen in TBOTB TV special corralling the boys and getting bags out of the limo at LAX at the start of the road trip. Apparently a musician, I don't know what he played. He was listed as an A&M employee in their 10th Anniversary book. I voted for "In A Little Spanish Town". This album is nice and all, but it and SRO are not exactly my favorites of the TJB era. They just seem too different after the "big three", and I prefer NINTH because it seemed, at least to me, to maybe be a beginning back toward that era. Then again, I'm not a trumpet aficionado like some of you are, so I'm probably wrong about that. I like NINTH too but you can definitely hear Herb's trumpet playing beginning to soften on that album. I sometimes think it's a stylistic thing -- he's playing more casually with just about every release starting with SRO -- but then he had his "burnout" period a couple of years after that, so who knows how much of the change was due to that and how much was intentional. I remember during the vinyl era (jeez, am I that old now???) I had a hard time finding a clean stereo copy of this album. I had several mono versions, though. As far as a favorite I chose "Wade In The Water" - it just rocked! Lately I've been playing "Gotta Lotta Livin' To Do" a lot, because I love how the rhythm section cooked on this song. "Treasure Of San Miguel" is another fave, especially during the last verse where the trombones play off of the melody. I never could get into "Miss Frenchy Brown" at all, and I have to be in the right mood for "The Charmer", which always makes me feel as if I'm in a department store. At 28 minutes long this album could've used another song. "Bo-Bo" was the first song I heard from this LP -- via the MUSIC BOX album. At the time this came out, the only TJB albums I owned were GOING PLACES and WHAT NOW MY LOVE...but I was poring over the others in the bins wishing I had the $ to buy another! Simply put, this was the pinnacle of the TJB, IMHO. All I can say is that this album was so good that I couldn't pick an honest favorite track. I picked "... Livin'" just because it's the 1st track, and gets me in the mood to enjoy what I feel to be my absolute favorite TJB album. SOUNDS LIKE Herb, and the TJB, were in full force, and still at the top of their game. Everything afterward was a wind-down, where Herb was wearing out, getting tired of it all and leading up to the 'quit touring decision' in 1969. As someone else on this thread has put it, "Just my 2 cents..."
We talked about this a tad last year -- and considered numerous contributing causal factors: For instance, that Herb reduced his daily practice routine; or that he wasn't putting as much air through the horn or properly supporting his tone as is customarily done for trumpet; or that he was purposely experimenting with reduced air flow and close miking. Regardless of what he specifically did, Herb's playing has always exhibited a unique, exaggerated marcato style -- with sharp percussive/explosive bursts of air (e.g., listen to him screwing around with this during the intro to Gotta Lotta Livin' To Do) -- as opposed to longer, smoother, legato notes. All of these are plausible to explain the tonal changes very much evident on Ninth. Additionally, Mike brings up a very good point in that beginning with SRO Herb did seem to give his horn technique the "Bob Dylan" (i.e., "one take") treatment. This is quite noticeable with Flamingo which, for my 2-cents, just gets too couldn't-care-less sloppy in places. The one point that can't be argued is that Herb is a supreme stylist -- and, like Miles Davis, just a couple of notes reveals to the accustomed listener that it's Herb blowing. Oh yeah, it's also worth noting that Herb's style was the bane of many trumpet teachers, during the 1965-75 period, who were abhorred at his marcato stylings -- particularly given that deadly combination of charismatically unique musical attributes and impressionable youth with too much time on their hands. (I was surely under his spell in the beginning of learning to play...though a couple Kenny Dorham LPs forever cured me of developing a lifetime arsenal of Herbisms). This is a surprise to me. I recall reading somewhere that Bacharach cut this in London and sent the tapes to L.A. where Herb recorded the trumpet part. From this, it would appear the entire TJB (and then some) were in the L.A. overdub session. That surprised me too. You can definitely hear Julius on the marimba, but I was always under the impression that the rest was Bacharach's studio band. Maybe the TJB members did an experimental backing track that was later left on the cutting room floor? That's my guess, or they recorded a TJB "band" version in addition to having another version with Herb and percussionists overdubbing their parts on top of Bacharach's orchestra. I don't recall where I read about it, but I do clearly remember it being said that the tapes were flown over from London, where the rest of the soundtrack was recorded, to have Herb's parts overdubbed for the theme song. With multitrack in its infancy, it's possible that there were other instruments recorded at the same time, but only Herb and the percussionists (including Julius...although any percussionist could have played that minimal marimba part) were used in the final mix. Burt Bacharach called me from London while he was doing the score for the movie Casino Royale, and asked if I would play the trumpet over the track that he had just recorded. He sent the tape and I put a couple of trumpets on, added some maracas (shaker) and sent back the two-track stereo tape. It fit very nicely in the movie. Burt was happy. I was happy. That's where I read it!